The Land Rover Explore is not simply capitalizing on the name of a famous car brand—it is also intended to be a very special rugged phone: With its attachable Adventure Pack, the phone is ready for days of exploration. It is also robust and waterproof to boot. Is it a must for outdoor enthusiasts? Great rugged build, but the battery life, camera and general reliability need to be better. The Land Rover Explore is an ultra-rugged phone for hikers, trekkers, mountain bikers, and anyone who lives a life of outdoor adventure. It costs £599. It’s a pleasant change from uglier ‘high-vis’ rugged phones that seem most at home in the pockets of construction workers. Yet the rugged side of the Land Rover Explore is still real and useful. Land Rover Explore ultimatives Outdoor-Handy? Model: The Land Rover Explore is a phone built for outdoor pursuits which impress on durability and data-gathering. As its name suggests, the phone has exploration at its heart. It’s a device user can take when hiking, mountain biking, kayaking or camping and it’ll not only help a user navigate surroundings but will also keep going for days at a time without needing to be charged. In fact, it’s IP68-rated, so resistant to water (to a depth of 1.5 meters for up to 30 minutes), but also to sand, dust, dirt, vibration, humidity and salt mist. As for design, its smooth edges and button-less front make it one of the best-looking tough phones out there. There’s no home button or fingerprint scanner here, so the only way to wake it up from standby is to tap the power button on the side and then hammer in your passcode or sketch out your pattern. On the top, there’s a 3.5 mm headphone port, on the bottom a USB-C slot for recharging, while the sides sport rubberized volume buttons and a slot for a microSD card and two SIM cards. The Land Rover Explore’s 5-inch 1,920 x 1,080 display is fine for everyday use. It’s a rather bright display too. It lacks some vibrancy, but the Explore’s Full HD screen still offers plenty of detail and is easily visible in eye-stingingly sunny days. As for hardware specifications, it features a 2.6 GHz deca- core MediaTek Helio X27 processor, 4 GB RAM and 64 GB storage. The Land Rover Explore also gives a 16 MP rear camera and 8 MP front-facing one to capture your adventures. Shots were generally acceptable. It is capable of capturing images with reasonable levels of sharpness and accurate color reproduction. Despite being one of the toughest phones, the Land Rover Explore isn’t as overbearingly large or chunky as we were expecting, at least not when the Adventure Pack is detached. At 228 g, though it’s still heavy compared with the OnePlus 6, which weighs 177 g. It includes a proximity sensor, compass, accelerometer, gyroscope, barometer, a GPS patch antenna and a 4,000 mAh battery that can be almost doubled with a clip-on module that comes with the phone. The Explore’s modified Android Nougat operating system with an update to Oreo planned also makes it easy to access metrics that might be useful outdoors. Coupled with the presence of OS maps, a powerful GPS module, and the ViewRanger app complete with augmented reality for identifying mountain peaks and other landmarks. The Land Rover Explore is an undeniably handy tool for the outdoors. 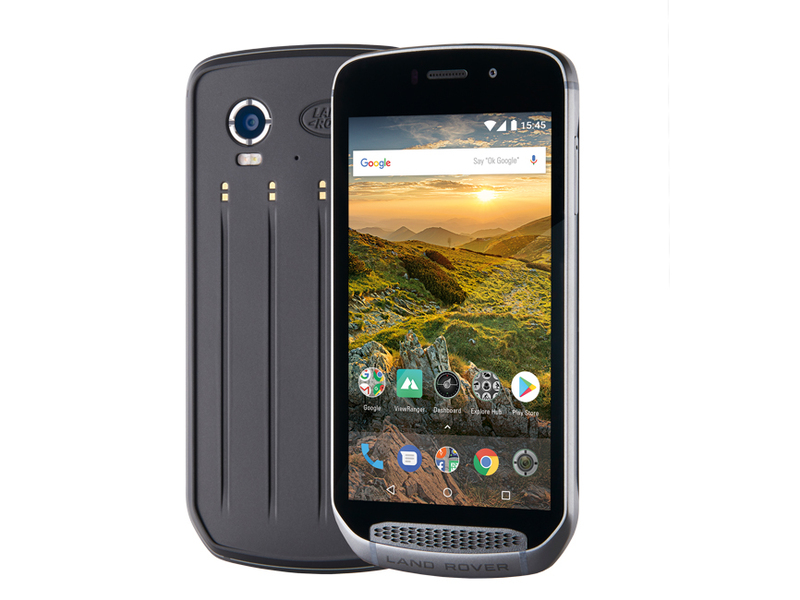 The Explore also comes with an Adventure Pack, a kit containing a nicely designed 3,620 mAh additional battery that attaches to the back of the phone using magnets, along with a 25 x 25 mm ceramic patch GPS antenna. There's also a plastic case that encloses the battery when attached to the Explore and has a stainless-steel carabiner attached.